Pearl necklaces. Stylish earrings. Diamond rings. Every girl loves a fancy piece of jewelry, but did you know that many around your own age are making a business out of designing their own? I've found many talented teenage girls and young adults on Etsy.com who are sharing their masterpieces with the world. I'll share eight stunning young designers to inspire your jewelry collection. 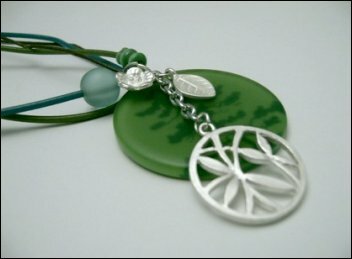 I absolutely love the nature-y theme of this gorgeous green pendant necklace. Necklace is 18 inches long, inspired by the designer's love of Africa. Darcie offers a variety of beautiful eclectic jewelry and beads in her online shop, and she has a great sense of humor. If you love nature, bright colors, or lovely pendants, then this shop is for you! 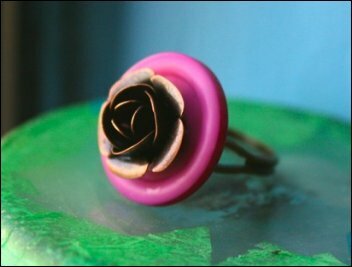 A trendy copper flower sits delicately upon a brightly colored button and adjustable ring to fit nearly any finger size. I fell in love with this item the moment I saw it! Frances is very creative, designing with buttons, beads, computer keys, and anything cool she can find. Energy, youth, and elegance best define her online shop. 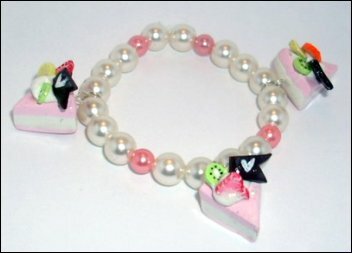 Three adorable cake charms topped with kiwis and strawberries adorn a 7 inch white and pink pearl bracelet. Each piece of cake is handcrafted from polymer clay. Brooke creates a lot of cute and kitchy polymer clay pieces, as well as stylish bows and roses jewelry items. Definitely cute! Details, details! 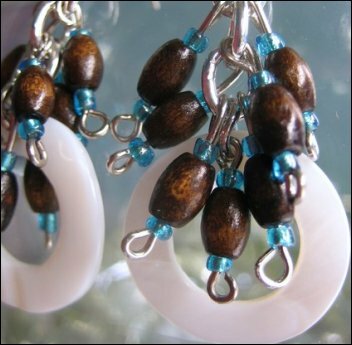 These striking earrings display large circular shell charm beads with natural wood and blue glass seed bead accents. Melissa is the queen of details, using a variety of bright and natural hues. Each piece in her shop is designed with its own unique flavor, so there's something for everyone. For the most part, Melissa features earrings, but she also designs bracelets, including one to match the earrings above! Complete your outfit with Jessica's jewelry. 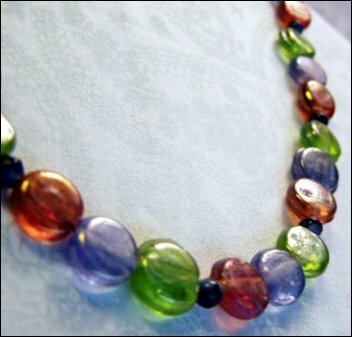 This simple 14 inch necklace made with green, blue, and orange "bubble" beads is perfect for any young fashionista. Love hearts, shells, stones, and Hawaiian sunsets? 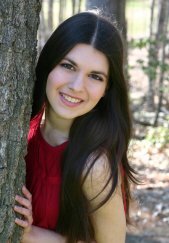 She offers unique necklaces, bracelets, pendants, and earrings. I especially like her Cosmic Pink and retro inspired pieces. 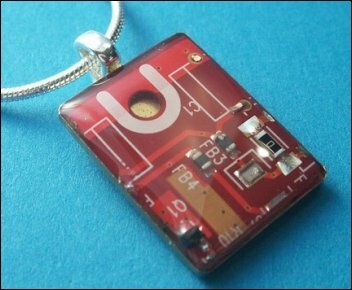 Amanda takes techy fashion to the next level with these stunning circuit pendant necklaces. She also creates cute little "gummy bears" and other pendants from resin, as well as detailed beaded bracelets. She even made the gummy bear mold herself! I especially like her Ice Cream's Best Friend and Carnival Spots pendants. Embroidering thread is Carrie's tool of the trade. Much detail and patience goes into each friendship bracelet she creates as she saves money for college. I especially have great appreciation for her pink and orange "S" bracelet shown. Brilliant elegance are the best words to describe Lauren's pieces. 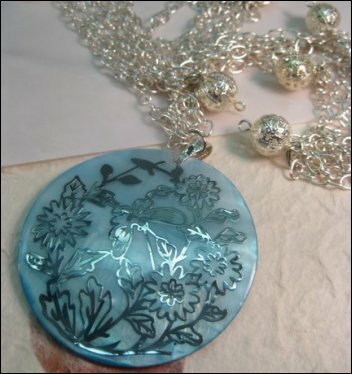 Lovely garden flowers and a butterfly are embossed on a shell pendant. Add elegance to any outfit with this 18 inch necklace! The pendant is attached to a shiny silver chain adorned with silver ball charms. Also, 10% of all sales in Lauren's shop will benefit Invisible Children, so you can buy gorgeous jewelry while supporting a great cause. I hope these talented jewelry artists have inspired your own jewelry collection, or perhaps even an idea for an online business. Learning jewelry design techniques yourself can be accomplished by searching the internet and borrowing books from the library. Try them out, and ask your friends for opinions, and you too may become a handcrafted jewelry artist someday.